Culture | A former apartment house of the landlord Belokrylzeva. Today it be Nizhegorodskaya customs service. 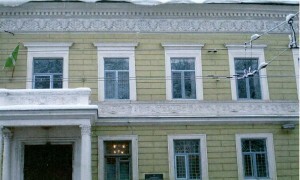 A former apartment house of the landlord Belokrylzeva. Today it be Nizhegorodskaya customs service. Nizhny Novgorod synagogue. Nizhny Novgorod, street of Georgian, 5, korp.1. Nearest metro station Gorkovskaya 690 m Moscow 3 km Moscow 3 kmThe window above the front door in a wooden house. Bolshaya Pecherskaya.